A monument commemorates those who lost their lives in the sinking of the S.S. Casino off Apollo Bay in 1932. A plaque was added to the memorial in 1982 to commemorate the 100th anniversary of the registration of the vessel and the 50th anniversary of the sinking. 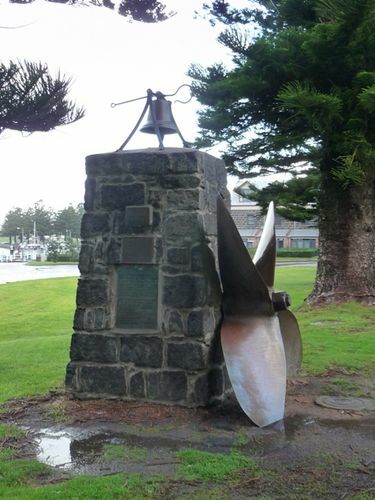 The monument is a pillar of eight courses of bluestone blocks, 2.5 metres high with the propeller of the ship affixed to the west face, and the wreck bell which originally hung in the yard of the Customs House at Port Fairy mounted on the top of the cairn. Flagship of the Belfast and Koroit Steam Navigation Company based in Port Fairy. The tragic loss of the SS Casino was felt particularly by people of Victoria`s western district. For fifty years, the iron steamship took cargo and passengers between Melbourne and Portland, stopping at Apollo Bay, Warrnambool and Port Fairy. The SS Casino was an important feature of local maritime life. The SS Casino made 2,500 voyages in the treacherous waters of Bass Strait and was considered one of the “immortals” of Port Phillip. The steamer had several brushes with disaster; it collided with another boat off Point Gellibrand, ran aground on a reef near Grey River, and was beached at Warrnambool while entering Lady Bay in a power blackout. Following each incident, the steamer was repaired and returned to its west coast run. On the 10th July, 1932 the SS Casino sank while trying to secure a mooring at Apollo Bay pier. This time, the steamer could not be saved and the Captain and nine other crew lost their lives. First Master Of The S.S. Casino. Of The Registration Of The S.S.
Bay On 10th July, 1932.